OK, don’t freak out … but Tujiro is a vampire. Deep breaths … deep breaths … good. Now. Where do we go from here? It’s a fun question to pose whenever a protagonist is confronted with the unexpected. More importantly, how is Christine Spar supposed to react to this? What makes sense in the world she lives in? Well, she knows that Argent is real, and he’s basically a cursed werewolf. So there’s some precedent for the supernatural. A vampire isn’t too far off from a werewolf, but it’s still pretty jarring. This kind of world-building can be made or broken depending on how the characters respond. Christine panics, flees, and promptly bugs Tujiro’s car. She’s pretty sure what she saw was real, and she’s pretty sure she can’t kill him (so she’s not always overconfident) until she figures out what he is. Later, at a new hotel to avoid the police, she listens in on Tujiro’s conversation as his driver takes him to the theatre: they’re planning to kidnap Brian Li Sung and sell him to one of their “clients.” Christine, horrified, goes out of her way to keep him close. Again, she’s at her most human around him. And Brian–still so innocent and unaware of the danger–provides a bright spot in an otherwise horrific story. After he leaves for work, Christine researches vampirism–seems like a pretty good idea, if you’re in that situation–then trails Brian later in the evening. Grendel waits on a neighboring rooftop, watching through binoculars. Tujiro’s driver shows up and stands outside his car, smoking a cigarette. In the last panel, we see Tujiro behind Grendel, towering over her. There’s a great moment in this issue where Christine spots her nemesis at a cast party. Tujiro is standing behind Brian Li Sung when he meets eyes with Christine. The panels are vertical, and cut multiple times between Grendel and the vampire. Clearly, Christine isn’t afraid of him. But Tujiro also betrays an overconfidence with his enemy–in his car, he tells his driver that Christine is nothing more than an annoyance. Argent isn’t quite so dismissive of this new Grendel. In fact, he’s pretty confident that she’ll pile up more dead bodies before she’s through. The Pander Brothers and Wagner do a good job of fleshing out Argent just by placing him in his home. He paces in his chair in front of a massive collection of books–we’re talking floor-to-ceiling cases here. His partner in the police force keeps to the shadows and smokes an old-fashioned pipe. So we know Argent hasn’t just been stewing away for years. He still has contacts with the police and enough reputation to sway an investigation. He’s well-read, too. This isn’t a superhero comic. This doesn’t have the stamp of the Comics Code Authority, so you can’t expect the heroes to triumph over evil. And Christine doesn’t shy away from her fascination with Hunter Rose anymore–if anything, she embraces his ability to be deadly. She believes she needs it to kill Tujiro. And hey, you know what? I’ve never fought a vampire, so I can’t really judge on this one. What do we know about Vampires? In Wagner’s world, a vampire feeds on blood and can go out in the sun. Tujiro also seems capable of either disappearing or creating illusions … hard to tell, given how unsure Christine is when she loses sight of him at the cast party. We Were Promised Flying Cars: I don’t know why anyone in the 90’s thought this was a technology right around the corner. It doesn’t even make sense. Here’s about the closest we’ve gotten. About the Inker: Jay Geldhof is going to be around Grendel for a long time, and as the series grows his style starts to take on a life of its own. By the time we get to the Giant Gun (more on that in about ten issues! 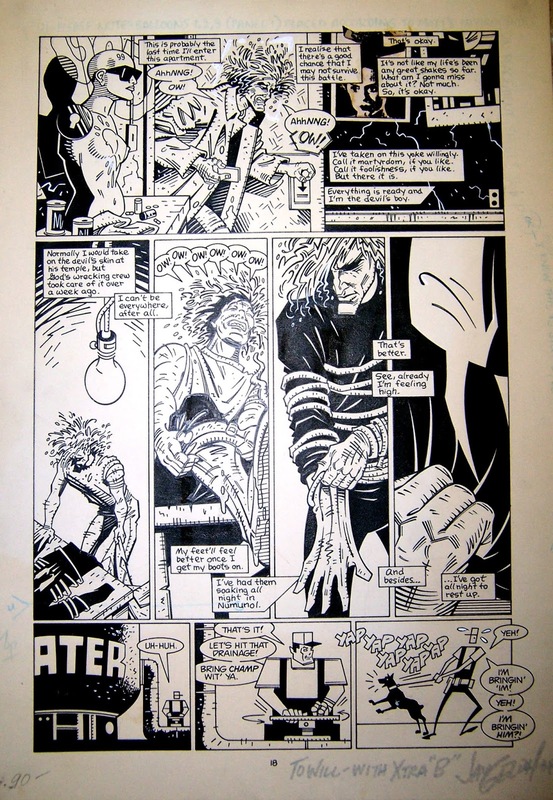 ), Geldhof’s inking runs like veins through the Grendel series. But the use of blacks in the coloring scheme takes on increased importance as Christine Spar relies more and more on the Grendel mask. Here’s a sample of Geldhof’s inking work from a future issue of Grendel. If you want an example of something from his later work, here’s a link to a Dr. Strange comic he inked. Maybe I’ll try and shoot him an email to do a short interview. Next: Grendel #5: Devil in Despair!